Di(2-ethylhexyl) phthalate (DEHP) is widely used in polyvinylchloride-based materials and remains intact in the environment. Lungs are one route of entry of DEHP into the body; however, there is limited information on the effects and mechanism of action of DEHP on non-small cell lung cancer (NSCLC). Here, we addressed this by examining the effect of DEHP on the proliferation of A549 human lung adenocarcinoma cells by MTS assay. The induction of inflammation and epithelial-to-mesenchymal transition (EMT), as well as activation of the mitogen-activated protein kinase (MAPK) and Wnt/β-catenin signaling pathways, were assessed by western blot and real-time polymerase chain reaction. Although there were discrepancies in the concentration, DEHP treatment enhanced A549 cell viability accompanied by increased mRNA and protein levels of inflammation-related factors, such as matrix metalloproteinase-9 and nuclear factor-κB. Additionally, EMT was activated in cells according to decreased E-cadherin and increased vimentin expression. Furthermore, MAPK pathway components, including phosphorylated p38 and c-Jun N-terminal kinase, and Wnt/β-catenin pathway components, including phosphorylated glycogen synthase kinase 3β and β-catenin, as well as their downstream genes c-Myc and cyclin D1, were upregulated in the presence of DEHP. These results suggest that DEHP promotes NSCLC progression by promoting cell proliferation, inflammation, and EMT via activation of Wnt/β-catenin signaling. Lung cancer is a common malignancy with high morbidity and mortality (DeSantis et al., 2014). Non-small cell lung cancer (NSCLC) accounts for > 80% of all lung cancer cases, with a 5-year survival rate in the United States of 15% (Crinò et al., 2010) and metastasis the primary cause of poor prognosis (Gupta and Massagué, 2006; Berge and Doebele, 2014). Risk factors, such as pollutants, smoking, and genetics, contribute to the NSCLC development (Schottenfeld et al., 2013); therefore, identifying these factors and documenting their effects and modes of action is necessary in order to mitigate their effects. Recent data suggest that endocrine disruptors can promote NSCLC progression (Zhang et al., 2014; Rafael-Vázquez et al., 2018; Wang et al., 2017).These include natural and synthetic compounds, such as environmental estrogens, that interfere with the normal endocrine system of animals and humans and mimic the action of natural estrogen in the body (Markey et al., 2002). NSCLC cells express estrogen receptor (ER) and respond to estrogenic signals (Stabile et al., 2002), and estradiol stimulation of ERα enhances NSCLC cell migration and invasion (Siegfried et al., 2009). Di(2-ethylhexyl) phthalate (DEHP) is a widely used plasticizer in polymer products, such as beverage and food containers, cosmetics, clothes, and medical devices. DEHP has been detected in the air and polyvinylchloride-containing devices used for pulmonary therapy (Su et al., 2012) and might constitute as much as 67% of the total weight of the latter (Bustamante-Montes et al., 2004). DEHP is not covalently bound to plastic polymers and can, therefore, be released into the environment. Continuous exposure to DEHP can result in its internalization through food digestion and inhalation and subsequent accumulation in the body (Kim, 2016). Additionally, DEHP can bind ERα and mimic the action of natural hormones (Ohashi et al., 2005). Moreover, DEHP exerts carcinogenic effects, especially in steroid-hormone-dependent cancers (Tanay Das et al., 2014; Miao et al., 2017), with several studies suggesting an association between exposure to phthalates and an increased risk of hormone-related cancers, such as breast cancer. Because NSCLC cells express high levels of ERα (Miao et al., 2017; Brueckl et al., 2013), it is possible that they are also affected by DEHP; however, the mechanism of action of DEHP in NSCLC has not been previously reported, and it remains unclear whether DEHP exposure can affect inflammation and epithelial-to-mesenchymal transition (EMT) in NSCLC cells. In this study, we examined the effect of environmental DEHP exposure on the proliferation of NSCLCs cells and induction of inflammation, EMT, and intracellular signaling pathways in vitro. A549 human bronchial epithelium cells were obtained from the American Type Culture Collection (Manassas, VA, USA) and cultured in Dulbecco’s modified Eagle medium (Gibco, Carlsbad, CA, USA) supplemented with 10% fetal bovine serum (Gibco) and 1% penicillin/streptomycin under standard culture conditions (5% CO2 and 37°C). Cell viability was evaluated with the MTS assay (CellTiter 96AQueous cell proliferation assay kit; Promega, Madison, WI, USA) according to manufacturer instructions. Briefly, cells were cultured for 24 hr and 48 hr in 100 μL of culture medium, followed by the addition of MTS at 20 μL/well. Cells were incubated at 37°C for 4 hr, and absorbance was measured using a microplate reader at 490 nm. RNA was isolated from cells using TRIzol reagent (Invitrogen, Carlsbad, CA, USA), and cDNA was prepared from the RNA using an oligo (dT) primer and reverse transcriptase (Takara, Shiga, Japan) according to standard protocols. PCR was performed using SYBR Green on an ABI 7500 real-time PCR system (Applied Biosystems, Foster City, CA, USA). Each reaction contained 200 nM of each primer, 10 μL 2_SYBR Green PCR master mix (Applied Biosystems), 5 μL cDNA, and RNase-free water to a total volume of 20 μL. The reaction conditions were as follows: 95°C for 10 min, and 40 cycles of 95°C for 15 sec and 60°C for 1 min. The nucleotide sequence of primer pairs used to determine matrix metalloproteinase (MMP)9,nuclear factor kappaB (NF-κB), and glyceraldehyde 3-phosphate dehydrogenase (GAPDH)were as follows:MMP9 sense primer, 5′-GAACCAATCTCACCGACAGG-3′and antisense primer, 5′-GCCACCCGAGTGTAACCATA-3′; NF-κB sense primer, 5′-GTGGCAGCTCTTCTCAAAGC-3′and antisense primer, 5′-TCCAGGTCATAGAGAGGCTCA-3′; and GAPDH sense primer, 5′-GCACCGTCAAGGCTGAGAAC-3′ and antisense primer 5′-TGGTGAAGACGCCAGTGGA-3′.Reactions were prepared in triplicate, and target mRNA expression was normalized to the level of the internal control (GAPDH) using the 2−∆∆Ct method. Cells (1 × 106 cells/mL) were resuspended in radio immunoprecipitation buffer containing 50 mM Tris (pH 8.0; Cell Signaling Technology, Danvers, MA, USA) and a protease-inhibitor cocktail (cOmplete Mini protease inhibitor tablet; Roche Diagnostics, Mannheim, Germany). The protein concentration of the supernatant was measured with a Pierce BCA protein assay kit (cat. no. 23225; Thermo Fisher Scientific, Waltham, MA, USA). A total of 40 μg of protein was loaded in each lane, and proteins were separated by sodium dodecyl sulfate polyacrylamide gel electrophoresis on a 10% resolving gel and electroblotted onto a nitrocellulose membrane (cat. no. LC2009; Thermo Fisher Scientific) that was then blocked for 2 hr at room temperature in a solution of 5% skimmed milk in Tris-buffered saline and Tween-20 [TBST; 20 mM Tris, 500 nM NaCl, 0.1% Tween-20 (pH 7.5)]. The membrane was incubated at 4°C with antibodies against the following proteins: MMP9 (cat. no. 13110;1:1000), phosphorylated NF-κB p65 (Ser536) (cat. no. 3033;1:1000), E-cadherin (24E10) (cat. no. 3195; 1:1000), vimentin (R28) (cat. no. 3932; 1:1000), phosphorylated (p)-p38 mitogen-activated protein kinase (MAPK) (Thr180/Tyr182) (cat. no. 9211;1:1000), p-stress-activated protein kinase/c-Jun N-terminal kinase (JNK) (Thr183/Tyr185) (cat. no. 9251; 1:1000), c-Myc (D84C12) (cat. no. 5605; 1:1000), cyclin D1 (92G2) (cat. no. 2978;l 1:1000), β-catenin (cat. no.9562; 1:1000), p-glycogen synthase kinase (GSK) 3β (Ser9) (cat. no. 9336; 1:1000), and GAPDH (cat. no. 2118;1:5000) (all from Cell Signaling Technology). After three washes with TBST, the membrane was incubated for 2 hr at room temperature with horseradish-peroxidase-conjugated anti-IgG secondary antibody (cat. no. 65-6120; 1:5000; Invitrogen). Protein bands were visualized with Pierce enhanced chemiluminescence substrate (Thermo Fisher Scientific), and signal intensity was quantified by densitometry using ImageJ software (v.1.29x ; National Institutes of Health, Bethesda, MD, USA). Data are presented as the mean ± standard deviation of three independent experiments. The Kolmogorov–Smirnov test was used to evaluate whether data were normally distributed; in this case, continuous variables were compared using the two-sample Student’s ttest or by three-group analysis of variance, followed by Fisher’s least-significant-difference posthoc analysis for pairwise comparisons. For non-normally distributed data, variables were compared with the Mann–Whitney U test or the Kruskal–Wallis test, followed by the Mann–Whitney U test with Bonferroni correction, depending on whether two or three groups, respectively, were considered. Statistical analyses were performed using SPSS software (v.14.0; SPSS Inc., Chicago, IL, USA). A P < 0.05 was considered statistically significant. We assessed the effect of DEHP (0, 10, 50, and 100 μM) on the viability of A549 NSCLC cells using the MTS assay. NSCLC cells treated with 5 μM, 10 μM, and 50 μM for 24 hr and 48 hr showed higher viability relative to untreated controls (Fig. 1). By contrast, A549 cells exposed to 100 μM DEHP for 48 hr and 72 hr showed reduced viability relative to cells treated with 50 μM DEHP. Therefore, in subsequent experiments, cells were treated with 0 μM, 10 μM, and 50 μM DEHP for 24 hr. Viability of NSCLC cells exposed to DEHP. A549 cells were treated with 0, 5, 10, 50, or 100 μM DEHP for 24, 48, and 72 hr. Data represent the mean ± standard deviation of three independent experiments performed for 24, 48 or 72 hr. *P < 0.05. To assess the effect of DEHP exposure on inflammation, we examined the mRNA expression of the inflammation markers MMP9 and NF-κB by PCR in A549cells. Both transcripts were upregulated in A549 cells after 6 hr and 24 hr of treatment with 50 μM DEHP as compared with levels in untreated control cells (Fig. 2A). Western blot analysis confirmed that MMP9 and NF-κB protein levels were also elevated after 24 hr of treatment with 50 μM DEHP relative to the control group (Fig. 2B). Effect of DEHP on MMP9 and NF-κB mRNA and protein levels in NSCLC cells. A549 cells were exposed to 0, 10, and 50 μM DEHP for 24 hr. Data represent the mean ± standard deviation of three independent experiments performed for 24 hr. *P < 0.05. To determine whether DEHP promotes carcinogenesis in NSCLC by inducing EMT, we evaluated protein levels of the epithelial marker E-cadherin and the mesenchymal marker vimentin in A549 cells by western blot. Exposure to 10 μM and 50 μM DEHP resulted in the downregulation of E-cadherin and upregulation of vimentin relative to the untreated control group (Fig. 3), suggesting that EMT was induced. Effect of DEHP on EMT in NSCLC cells. 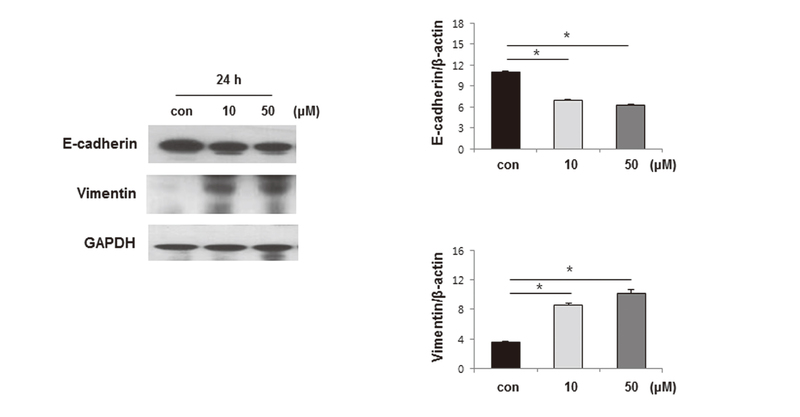 E-cadherin and vimentin protein levels were evaluated by western blot. Data represent the mean ± standard deviation of three independent experiments performed for 24 hr. *P < 0.05. To investigate the mechanism of action of DEHP, we examined the expression of MAPK-signaling pathway components, including phosphorylated p38 and JNK, by western blot. We found that both protein levels were upregulated in A549 cells after treatment for 24 hr with 10 μM and 50 μM DEHP as compared with levels in the untreated control group (Fig. 4). Additionally, examination of Wnt/β-catenin pathway components revealed that p-GSK3β and β-catenin, as well as the downstream targets c-Myc andcyclinD1, were upregulated following DEHP treatment (Fig. 5). Effect of DEHP treatment on the activation of MAPK signaling in NSCLC cells. p38 and JNK protein levels and phosphorylation in A549 cells and evaluated by western blot. Data represent the mean ± standard deviation of three independent experiments performed for 24 hr. *P < 0.05. Effect of DEHP on the activation of Wnt/β-catenin signaling in A549 cells. c-Myc, cyclin D1, β-catenin, and p-GSK3β levels evaluated by western blot. Data represent the mean ± standard deviation of three independent experiments performed for 24 hr. *P < 0.05. Our results demonstrated for the first time that DEHP increases tumor-cell proliferation and inflammation and induces EMT in NSCLC via activation of the Wnt/β-catenin and MAPK signaling pathways. DEHP is a plasticizer that is widely used in the manufacture of plastic products due to its fluidity and stability. Despite being banned by the European Union and the United States public health and safety authorities, DEHP is ubiquitous in the environment and considered an emerging pollutant (Gavrilescu et al., 2015; Net et al., 2015). Upon entering the human body, only ~7.3% of DEHP is metabolized to mono(2-ethylhexyl)phthalate (MEHP) and excreted in urine while most of the compound accumulates in the body (Wittassek and Angerer, 2008). MEHP induces DNA fragmentation and apoptosis via activation of caspase-3 in human macrophages (Yokoyama et al., 2003), triggers the migration of human testicular embryonal carcinoma cells (Yao et al., 2012), and promotes the progression of prostate cancer through activation of the Hedgehog signaling pathway in LNCaP human prostate adenocarcinoma cells (Yong et al., 2016). 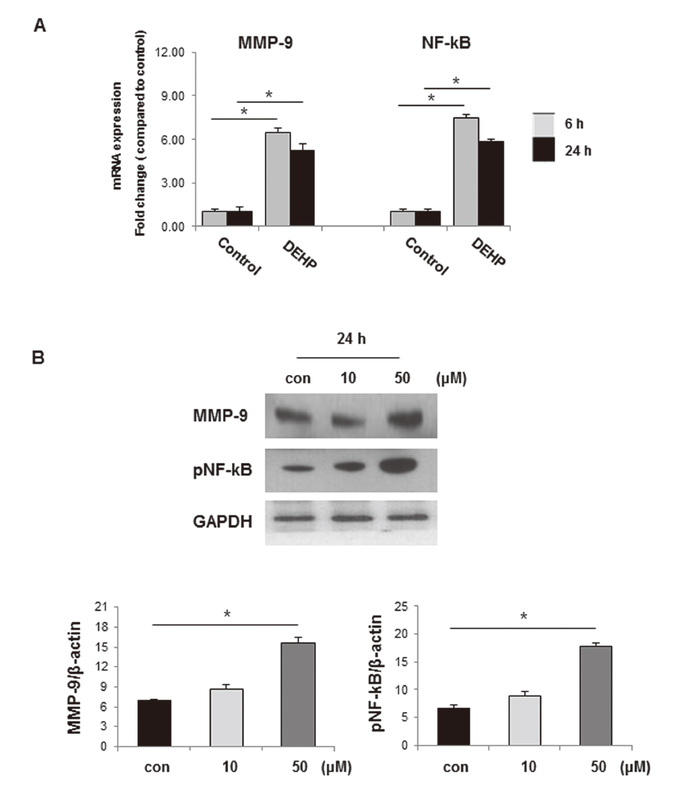 DEHP stimulates the proliferation of breast cancer cells, induces keratinocyte necrosis (Chen and Chien, 2014; Martinasso, et al., 2006), and enhances the invasion of neuroblastoma cells while stimulating the growth of hepatic carcinoma cells (Chen et al., 2013; Zhu et al., 2010). Furthermore, phthalates induce proinflammatory cytokine production in vitro (Ferguson et al., 2011) and possibly increase inflammation, which can have synergistic effects in combination with other risk factors (Ferguson et al., 2011; Burmeister et al., 2014). MMPs are a large family of proteolytic enzymes containing a zinc-bound catalytic domainand that degrade various components of the extracellular matrix to facilitate cell migration and invasion (Nissinen and Kähäri, 2014). MMPs play an important role in many biological processes, including inflammation (Khokha et al., 2013). NF-κB is a transcription factor that regulates the expression of MMPs in various cell types, and several pathogen-associated molecular patterns can activate NF-κB to promote MMP expression (Zhang et al., 2017). MEHP induces the expression of MMP2 in human testicular embryonal carcinoma cells (Yao et al., 2012), whereas DEHP promotes breast cancer cell invasion via induced expression of MMP9 (Zhang et al., 2016), which degrades collagen, fibronectin, and elastin in the extracellular matrix, thereby contributing to cancer progression (Deryugina and Quigley, 2006). Similarly, MMP13 activity is associated with tumor invasion and metastasis and inflammatory disease (Khokha et al., 2013; Supasorn et al., 2016). Moreover, NF-κB dysregulation is implicated in various diseases, including cancers, due in part to the resulting increased invasiveness of tumor cells (Zhang et al., 2012). MAPKs, such as p38 and JNK, regulate MMP9 secretion and NF-κB activity and modulate diverse cellular responses, such as proliferation, migration, and apoptosis. Additionally, MAPKs influence the expression of inflammatory cytokines upon pathogen exposure (Gómez et al., 2004). In the present study, DEHP treatment increased A549 cell viability following treatment for 24 hr (5-100 μM) and relative to control cells; however, no significant difference were observed in cells treated with 100 μM for 48 hr and 72 hr, suggesting a rapid, time-dependent response mechanism. Moreover, we observed upregulated MMP9 and NF-κB mRNA and protein levels relative to those in control cells, as well as enhanced phosphorylation of p38 and JNK. These results suggest that DEHP might induce inflammation in NSCLC to promote disease progression. Wnt/β-catenin signaling promotes metastasis and tumor-cell invasion through modulation of EMT-related factors (Dey et al., 2013). During EMT, carcinoma cells downregulate epithelial markers, such as E-cadherin, and express mesenchymal markers, such as vimentin (Dey et al., 2013; Kong et al., 2011). EMT is an important process in cancer metastasis that leads to cancer-cell migration and invasion into distal sites through activation of NF-κB signaling and other pathways (Hou et al., 2014; Liu et al., 2015). Our results showed that DEHP treatment induced EMT in NSCLC cells according to decreases in E-cadherin levels and increases in vimentin expression. The Wnt/β-catenin signaling pathway plays an important role in the induction of EMT (Fox et al., 2009). In the present study, we found that DEHP treatment enhanced levels of the Wnt/β-catenin-signaling components β-catenin and p-GSK3β and downstream effectors c-Myc and cyclin D1 in A549 cells, confirming that DEHP induced EMT at least in part by activating Wnt/β-catenin signaling. In conclusion, our results demonstrated that DEHP stimulates the proliferation of NSCLC cells and induces inflammation and EMT through activation of MAPK and Wnt/β-catenin signaling pathways. This represents the first report showing that Wnt/β-catenin signaling mediates the effects of DEHP in NSCLC. Although our observations require in vivo confirmation, they indicated that DEHP exposure can facilitate NSCLC progression. Additional research should be devoted to developing safer alternatives to DEHP in the manufacturing of plastic products. This study was supported by a National Research Foundation of Korea grant (no. 2017R1D1A1B03034223) funded by the Korean government. Berge, E.M. and Doebele, R.C. (2014): Targeted therapies in non-small cell lung cancer: emerging oncogene targets following the success of epidermal growth factor receptor. Semin. Oncol., 41, 110-125. Brueckl, W.M., Al-Batran, S.E., Ficker, J.H., Claas, S., Atmaca, A., Hartmann, A., Rieker, R.J. and Wirtz, R.M. (2013): Prognostic and predictive value of estrogen receptor 1 expression in completely resected non-small cell lung cancer. Int. J. Cancer, 133, 1825-1831. Burmeister, A., Assi, L.K., Ferro, C.J., Hughes, R.G., Barnett, A.H., Bellary, S., Cockwell, P., Pratt, G. and Hutchison, C.A. (2014): The relationship between high-sensitivity CRP and polyclonal free light chains as markers of inflammation in chronic disease. Int. J. Lab. Hematol., 36, 415-424. Bustamante-Montes, L.P., Lizama-Soberanis, B., Vázquez-Moreno, F., García-Fábila, M.M., Corea-Téllez, K.S., Olaiz-Fernández, G. and Borja-Aburto, V.H. (2004): [Infant exposure to potentially toxic plasticizers in products for oral use]. Salud Publica Mex., 46, 501-508. Chen, F.P. and Chien, M.H. (2014): Lower concentrations of phthalates induce proliferation in human breast cancer cells. Climacteric, 17, 377-384. Chen, X., Qin, Q., Zhang, W., Zhang, Y., Zheng, H., Liu, C., Yang, Y., Xiong, W. and Yuan, J. (2013): Activation of the PI3K-AKT-mTOR signaling pathway promotes DEHP-induced Hep3B cell proliferation. Food Chem. Toxicol., 59, 325-333. Crinò, L., Weder, W., van Meerbeeck, J. and Felip, E.; ESMO Guidelines Working Group. (2010): Early stage and locally advanced (non-metastatic) non-small-cell lung cancer: ESMO Clinical Practice Guidelines for diagnosis, treatment and follow-up. Ann. Oncol., 21 (Suppl 5), v103-v115. Deryugina, E.I. and Quigley, J.P. (2006): Matrix metalloproteinases and tumor metastasis. Cancer Metastasis Rev., 25, 9-34. DeSantis, C.E., Lin, C.C., Mariotto, A.B., Siegel, R.L., Stein, K.D., Kramer, J.L., Alteri, R., Robbins, A.S. and Jemal, A. (2014): Cancer treatment and survivorship statistics, 2014. CA Cancer J. Clin., 64, 252-271. Dey, N., Barwick, B.G., Moreno, C.S., Ordanic-Kodani, M., Chen, Z., Oprea-Ilies, G., Tang, W., Catzavelos, C., Kerstann, K.F., Sledge, G.W. Jr., Abramovitz, M., Bouzyk, M., De, P. and Leyland-Jones, B.R. (2013): Wnt signaling in triple negative breast cancer is associated with metastasis. BMC Cancer, 13, 537. Ferguson, K.K., Loch-Caruso, R. and Meeker, J.D. (2011): Urinary phthalate metabolites in relation to biomarkers of inflammation and oxidative stress: NHANES 1999-2006. Environ. Res., 111, 718-726. Fox, E.M., Andrade, J. and Shupnik, M.A. (2009): Novel actions of estrogen to promote proliferation: integration of cytoplasmic and nuclear pathways. Steroids, 74, 622-627. Gavrilescu, M., Demnerová, K., Aamand, J., Agathos, S. and Fava, F. (2015): Emerging pollutants in the environment: present and future challenges in biomonitoring, ecological risks and bioremediation. N. Biotechnol., 32, 147-156. Gómez, M.I., Lee, A., Reddy, B., Muir, A., Soong, G., Pitt, A., Cheung, A. and Prince, A. (2004): Staphylococcus aureus protein A induces airway epithelial inflammatory responses by activating TNFR1. Nat. Med., 10, 842-848. Gupta, G.P. and Massagué, J. (2006): Cancer metastasis: building a framework. Cell, 127, 679-695. Hou, C.H., Lin, F.L., Hou, S.M. and Liu, J.F. (2014): Cyr61 promotes epithelial-mesenchymal transition and tumor metastasis of osteosarcoma by Raf-1/MEK/ERK/Elk-1/TWIST-1 signaling pathway. Mol. Cancer, 13, 236. Khokha, R., Murthy, A. and Weiss, A. (2013): Metalloproteinases and their natural inhibitors in inflammation and immunity. Nat. Rev. Immunol., 13, 649-665. Kim, H.Y. (2016): Risk assessment of di(2-ethylhexyl) phthalate in the workplace. Environ. Health Toxicol., 31, e2016011. Kong, C., Wang, C., Wang, L., Ma, M., Niu, C., Sun, X., Du, J., Dong, Z., Zhu, S., Lu, J. and Huang, B. (2011): NEDD9 is a positive regulator of epithelial-mesenchymal transition and promotes invasion in aggressive breast cancer. PLoS One, 6, e22666. Liu, S., Jin, K., Hui, Y., Fu, J., Jie, C., Feng, S., Reisman, D., Wang, Q., Fan, D., Sukumar, S. and Chen, H. (2015): HOXB7 promotes malignant progression by activating the TGFβ signaling pathway. Cancer Res., 75, 709-719. Markey, C.M., Rubin, B.S., Soto, A.M. and Sonnenschein, C. (2002): Endocrine disruptors: from Wingspread to environmental developmental biology. J. Steroid Biochem. Mol. Biol., 83, 235-244. Martinasso, G., Maggiora, M., Trombetta, A., Canuto, R.A. and Muzio, G. (2006): Effects of di(2-ethylhexyl) phthalate, a widely used peroxisome proliferator and plasticizer, on cell growth in the human keratinocyte cell line NCTC 2544. J. Toxicol. Environ. Health A, 69, 353-365. Miao, Y., Wang, R., Lu, C., Zhao, J. and Deng, Q. (2017): Lifetime cancer risk assessment for inhalation exposure to di(2-ethylhexyl) phthalate (DEHP). Environ. Sci. Pollut. Res. Int., 24, 312-320. Net, S., Delmont, A., Sempéré, R., Paluselli, A. and Ouddane, B. (2015): Reliable quantification of phthalates in environmental matrices (air, water, sludge, sediment and soil): a review. Sci. Total Environ., 515-516, 162-180. Nissinen, L. and Kähäri, V.M. (2014): Matrix metalloproteinases in inflammation. Biochim. Biophys. Acta, 1840, 2571-2580. Ohashi, A., Kotera, H., Hori, H., Hibiya, M., Watanabe, K., Murakami, K., Hasegawa, M., Tomita, M., Hiki, Y. and Sugiyama, S. (2005): Evaluation of endocrine disrupting activity of plasticizers in polyvinyl chloride tubes by estrogen receptor alpha binding assay. J. Artif. Organs, 8, 252-256. Rafael-Vázquez, L., García-Trejo, S., Aztatzi-Aguilar, O.G., Bazán-Perkins, B. and Quintanilla-Vega, B. (2018): Exposure to diethylhexyl phthalate (DEHP) and monoethylhexyl phthalate (MEHP) promotes the loss of alveolar epithelial phenotype of A549 cells. Toxicol. Lett., 294, 135-144. Schottenfeld, D., Beebe-Dimmer, J.L., Buffler, P.A. and Omenn, G.S. (2013): Current perspective on the global and United States cancer burden attributable to lifestyle and environmental risk factors. Annu. Rev. Public Health, 34, 97-117. Siegfried, J.M., Hershberger, P.A. and Stabile, L.P. (2009): Estrogen receptor signaling in lung cancer. Semin. Oncol., 36, 524-531. Stabile, L.P., Davis, A.L., Gubish, C.T., Hopkins, T.M., Luketich, J.D., Christie, N., Finkelstein, S. and Siegfried, J.M. (2002): Human non-small cell lung tumors and cells derived from normal lung express both estrogen receptor alpha and beta and show biological responses to estrogen. Cancer Res., 62, 2141-2150. Su, P.H., Chang, Y.Z., Chang, H.P., Wang, S.L., Haung, H.I., Huang, P.C. and Chen, J.Y. (2012): Exposure to di(2-ethylhexyl) phthalate in premature neonates in a neonatal intensive care unit in Taiwan. Pediatr. Crit. Care Med., 13, 671-677. Supasorn, O., Sringkarin, N., Srimanote, P. and Angkasekwinai, P. (2016): Matrix metalloproteinases contribute to the regulation of chemokine expression and pulmonary inflammation in Cryptococcus infection. Clin. Exp. Immunol., 183, 431-440. Tanay Das, M., Kumar, M. and Thakur, I.S. (2014): Differential toxicological endpoints of di(2-ethylhexyl) phthalate (DEHP) exposure in MCF-7 and MDA-MB-231 cell lines: possible estrogen receptor alpha (ERalpha) independent modulations. Indian J. Exp. Biol., 52, 1052-1061. Wang, Y., Zhao, M., Liu, J., Ni, J., Jiao, Y. and Bai, C. (2017): Up regulation of IL-6 is involved in di (2-ethylhexyl) phthalate (DEHP) induced migration and invasion of non small cell lung cancer (NSCLC) cells. Biomed. Pharmacother., 89, 1037-1044. Wittassek, M. and Angerer, J. (2008): Phthalates: metabolism and exposure. Int. J. Androl., 31, 131-138. Yao, P.L., Lin, Y.C. and Richburg, J.H. (2012): Mono-(2-ethylhexyl) phthalate (MEHP) promotes invasion and migration of human testicular embryonal carcinoma cells. Biol. Reprod., 86, 160. Yokoyama, Y., Okubo, T., Kano, I., Sato, S. and Kano, K. (2003): Induction of apoptosis by mono(2-ethylhexyl)phthalate (MEHP) in U937 cells. Toxicol. Lett., 144, 371-381. Yong, W., Jiao, C., Jianhui, W., Yan, Z., Qi, P., Xiu, W., Zuyue, S. and Yunhui, Z. (2016): Mono-2-ethyhexyl phthalate advancing the progression of prostate cancer through activating the hedgehog pathway in LNCaP cells. Toxicol. In Vitro, 32, 86-91. Zhang, K.S., Chen, H.Q., Chen, Y.S., Qiu, K.F., Zheng, X.B., Li, G.C., Yang, H.D. and Wen, C.J. (2014): Bisphenol A stimulates human lung cancer cell migration via upregulation of matrix metalloproteinases by GPER/EGFR/ERK1/2 signal pathway. Biomed. Pharmacother., 68, 1037-1043. Zhang, R., Zhao, J., Xu, J., Jiao, D.X., Wang, J., Gong, Z.Q. and Jia, J.H. (2017): Andrographolide suppresses proliferation of human colon cancer SW620 cells through the TLR4/NF-κB/MMP-9 signaling pathway. Oncol. Lett., 14, 4305-4310. Zhang, S., Ma, J., Fu, Z., Zhang, Z., Cao, J., Huang, L., Li, W., Xu, P. and Cao, X. (2016): Promotion of breast cancer cells MDA-MB-231 invasion by di(2-ethylhexyl)phthalate through matrix metalloproteinase-2/-9 overexpression. Environ. Sci. Pollut. Res. Int., 23, 9742-9749. Zhang, X.X., Fu, Z., Zhang, Z., Miao, C., Xu, P., Wang, T., Yang, L. and Cheng, S. (2012): Microcystin-LR promotes melanoma cell invasion and enhances matrix metalloproteinase-2/-9 expression mediated by NF-κB activation. Environ. Sci. Technol., 46, 11319-11326. Zhu, H., Zheng, J., Xiao, X., Zheng, S., Dong, K., Liu, J. and Wang, Y. (2010): Environmental endocrine disruptors promote invasion and metastasis of SK-N-SH human neuroblastoma cells. Oncol. Rep., 23, 129-139.